He is the historical founder of the Buddhism of our time. Around 2500 years ago this figure was born as a prince called Siddharta Gautama. 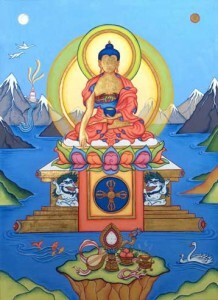 He reached the enlightened state at age 35 and since then was called ‘Buddha’, meaning the Awakened One or Enlightened One. After he reached the highest state of consciousness he started traveling in northern India, to offer his insights and teachings to a diverse range of people, and he did so the remaining 45 years of his life, until he died at age 80. The community of Buddhist monks and nuns (the Sangha) that followed The Buddha’s footsteps, helped passing on the Dharma teachings after he died and that’s why so many centuries later we are still inspired by his teachings. 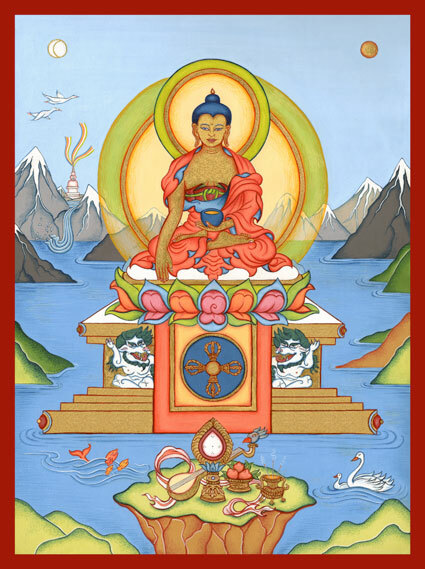 The practice of Buddha Shakyamuni and reciting his mantra helps you to purify the more negative actions of body, speech and mind, and this is essential for anyone who wants to make progress on the spiritual path. 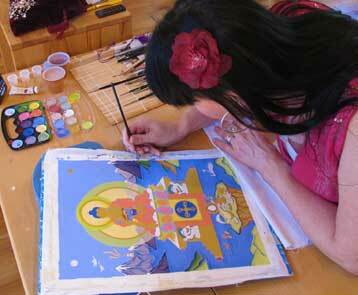 This Thangka painting of Shakyamuni is a sneak preview; it’s almost finished. This picture show the process of this artwork. As the painting is full of small details, it took quite a long time. 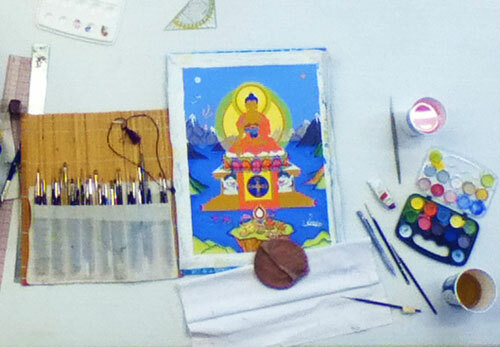 There’s a lot of (real) gold in this small thangka, it is used to paint the offerings, the throne and the body of the Buddha.